GPS on a Wrist Strap! The Foretrex™ 201 is a wearable Personal Navigator™, perfect for outdoor and marine enthusiasts who desire hands-free GPS navigation in a lightweight, affordable package. At a mere 2.75 ounces, this waterproof wonder is lighter than most watches, and its wrist-top mount frees up hands for outdoor activities. Sporting an ergonomic wristband, the Foretrex 201 is similar in design to the ForeRunner 201, yet is chocked full of GPS navigation features found in Garmin's popular Geko 201 unit. With a user-friendly interface, the rugged Foretrex 201 simplifies navigation, making it ideal for the backcountry or water. Its six dedicated buttons (GoTo, Page, Enter/Mark, Up, Down and Power) make it easy to operate. It offers the most essential navigation data — enhanced GPS accuracy, extensive storage for waypoints, and reversible routes and tracks — on an easy-to-read display. Don't worry about packing extra batteries, because the Foretrex 201 runs on an internal lithium battery for 15 hours (typical use). Simply recharge and go. The Foretrex 201 also comes equipped with special features sure to please mariners and hikers alike. It includes a unique application for sailing and paragliding racers that allows them to configure the start sequence of a race. The countdown is displayed in a large-number format that audibly alerts the user at each phase of the start sequence. With the help of Garmin's exclusive TracBack® technology, hikers can mark a campsite, go trekking all day, and follow the electronic "breadcrumb trail" back to camp in time for dinner. 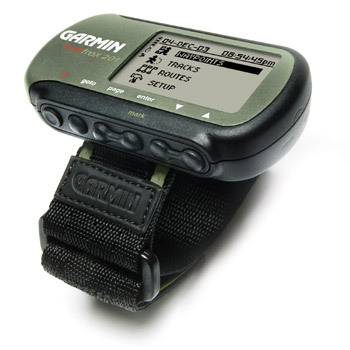 To order the Garmin Foretrex 201, add to cart. Add to cart to see actual sale price, or email jollyann@cableone.net for a price quote. 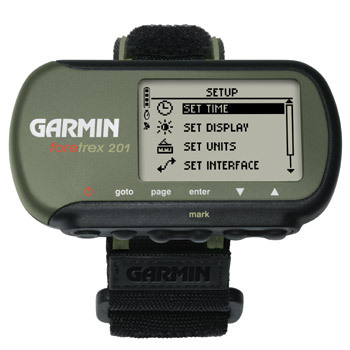 Garmin Foretrex 201 Add to cart to see sale price.